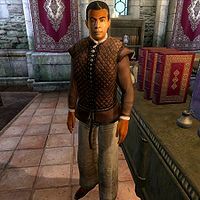 Phintias is a Redguard bookseller and the proprietor of the largest bookstore in Cyrodiil, First Edition. It is located in the center of the Market District in the Imperial City and contains a huge collection of both common and rare books, including The Refugees, Cleansing of the Fane and the unique scroll Document of Purile Banter [sic]. Because of Phintias’ extensive knowledge on rare books, First Edition is also involved in a number of quests. Like all the other merchants in the District, Phintias lives a life with lots of hard work and very little spare time. His private quarters are located above the main trading room and he sleeps there every night between midnight and 6am. After waking up, he heads downstairs and eats a two-hour breakfast before unlocking the door at 8am. After twelve long hours behind the counter he closes up shop at 8pm, with the exception of Loredas and Sundas where he will keep the shop open until midnight. At 8pm on Morndas, Middas and Fredas he will eat a four-hour dinner at the Merchants Inn. On Tirdas and Turdas he will leave the District for an exclusive dinner at the fashionable Tiber Septim Hotel in the Talos Plaza District. He wears light brown linens, a quilted doublet and doeskin shoes. Additionally, he carries the key to his store, a leveled amount of gold, and a copy of the Armorer skill book, The Armorer's Challenge, which is required to qualify for Armorer Training. When you enter the bookstore for the first time, he will politely introduce himself: "I'm Phintias, owner and proprietor of the First Edition. Look around. If I don't have it, maybe I can get it." Having wiped out all the smaller bookstores in the Big City, Phintias is not afraid of competition. When asked about the Imperial City he will gladly recommend the other bookstores found in Cyrodiil: "This is the only book store in the city. There's also Renoit's Books in Chorrol, Mach-Na's in Cheydinhal, and Southern Books in Leyawiin." Once he knows you, Phintias will greet you with either "Looking for some reading material? You've come to the right place." or "Need a book? You've come to the right place.". During the quest The Path of Dawn you will need his expertise to find the ultra-rare volume 3 of the Mythic Dawn Commentaries. First, Tar-Meena tells you that Phintias is the expert: "Phintias, the proprietor, caters to specialist collectors. He may have an idea of where to locate those books.". When you ask him, he will give you a lesson: "You must be referring to Mankar Camoran's "Commentaries on the Mysterium Xarxes." A common mistake. It comes in four volumes. The first two volumes are rare, but you may run across them from time to time. The third and fourth are impossible to find." When you tell him you need the last two volumes he will say: "I happen to have a copy of Volume Three on hand, but I’m afraid it is a... special order. Already paid for by another customer. Sorry. Gwinas would be terribly disappointed if it was gone when he came to pick it up. So sorry I can't help you." He also plays a role in the quest The Order of the Virtuous Blood. Roland Jenseric directs you to him for information on Seridur: "You may want to speak to Phintias at the First Edition bookshop in the Market District of the city. I know he goes there occasionally." In reply, Phintias tells you "Seridur? He comes in from time-to-time. Usually it's when he's out shopping. He always comes in with a large amount of travel food in his bag. Then sometimes he buys a few books. I asked him once about it, and he said that he goes out of the city on business trips. I think I overheard him once mention Memorial Cave to another patron of mine, but he never talked to me about it directly." and eventually offers to mark Memorial Cave on your map. The residents of the Imperial City are all aware of Phintias' expertise and will say that "Phintias has the best bookstore in the city. Of course, First Edition is the only bookstore in the city. ", "If you're looking for books, First Edition is the only place in the city to find them." and "Phintias has a good selection, and he'll find some rare books as well.". They also ask rhetorically "Is there a better bookseller in the city than Phintias? ", "Can you think of anyplace better to buy books than First Edition?" and conclude: "It's the only place to go for books." Others will get nostalgic: "It's a shame all the smaller bookstores are gone. I guess they just couldn't compete." and "It's a fine place, but I miss the personal attention I got at the smaller bookstores." A few named citizens will show great affection for Phintias’ bookstore as well. Amantius Allectus will say: "I'm here in the city for access to the Temple libraries, and for the bookstores... especially the First Edition in the Market District. ", while bookworm Hagaer will tell about his addiction: "It's terrible. I just can't walk past a bookstore. The First Edition, in the Market District, is the worst." During quests not directly related to Phintias, a lot of well-known Imperial City citizens will recommend First Edition for knowledge; During Tears of the Savior, a wizard from the University, Julienne Fanis, will tell you to find a copy of Knightfall for more knowledge on Garridan Stalrous: "I think I saw a copy last time I was at The First Edition Bookshop in the Market District." Also, when you’re looking to please Gin-Wulm in order to receive master training in Armorer, he will have you find a book, but will only tell you to visit First Edition: "I don't have a copy myself, but there was one in First Edition last time I was browsing there. At least some people take an interest in history." Phintias keeps the shop open longer on Loredas and Sundas because he has nothing else to do between 8pm and 12am. This causes him to keep offering services until his sleeping package starts at midnight. Esta página foi modificada pela última vez à(s) 08h52min de 1 de janeiro de 2014.